French President Emmanuel Macron has been criticised after saying that French people must remember the importance of “making an effort”, in his speech at this year’s galette des rois ceremony. 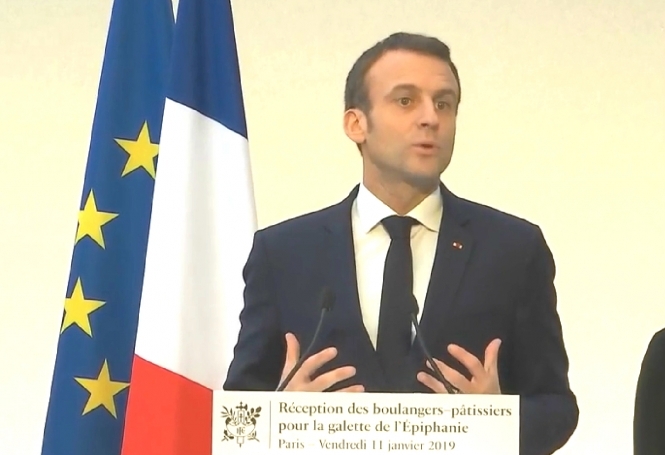 President Macron was speaking at the annual event at the Elysée Palace on Friday January 11, in front of a group of master bakers and patissiers, ahead of the cutting of the traditional “republican” galettes. He said: “The problems faced by our society are sometimes linked to the fact that many of our co-citizens believe that they can achieve [things] without applying effort. “Sometimes we have too often forgotten that next to the rights of each person in this Republic - and our Republic is peerless compared to many others - there are also responsibilities. The President appeared to be congratulating the master bakers and patissiers present for their achievements, but his choice of words has been heavily criticised. Opponents say that the speech was a thinly-veiled attack on the gilets jaunes protesters, one day before Acte 9 was scheduled to take place across the country. In the speech, the President also paid homage to apprenticeships, which “allow each young people to find their place in society”, and show the benefits of “working early mornings and late night, to achieve excellence”, at a time when “people think they can learn everything there is to know in a few days”. Mr Macron also congratulated the winner of the “best French-style baguette” competition: Laurent Encatassamy, a baker at Saint-Paulin in La Réunion. He also commended the winner of the “best baguette in Paris”: Mahmoud M’Seddi, a baker in the 14th arrondissement, who won out over 33,000 traditional bakers in France. The ceremony later saw the cutting of the two giant Elysée galettes, which are dubbed “Republican”, meaning that they do not contain a hidden king charm (known as a “fève” in French). Usually, the event would permit whoever finds the fève in their slice to wear the galette crown and name themselves “king” for the day. However, this has not happened in the Elysée ceremony for more than 40 years, as the risk of the President finding the charm - and then awkwardly declaring himself “king” - was deemed too great. In fact, the story goes that during the French Revolution, the galette was sometimes renamed as the “Gâteau de l’Egalité (Cake of Equality)”, to suspend the royal connotations entirely.